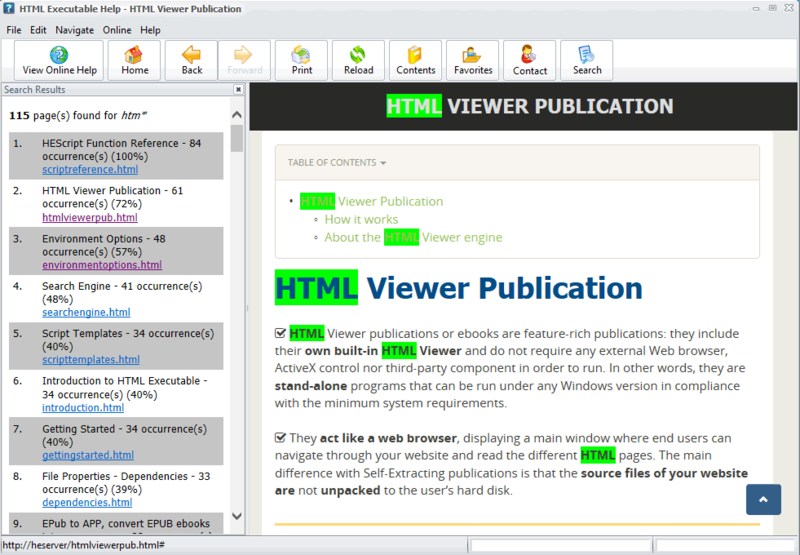 HTML Executable can include built-in search facility in your ebooks. End users can then search for occurrences of a word or a phrase through the entire ebook in a very short time. When compiling the digital publication, HTML Executable automatically indexes all HTML pages and PDF documents. It collects all keywords from them and builds a dictionary. This allows very fast searches. It is possible to search through PDF files even if the built-in PDF viewer engine is disabled. In that case, the default PDF reader will be used to display documents when a user clicks a search result. Search queries may also include some logical operators such as + (AND), OR, - (NOT), quotes ("red apple" for instance) and the wild card operators * and ?. Search results are automatically formatted and displayed to the end user in a page. You can of course modify the template of this page if you wish. 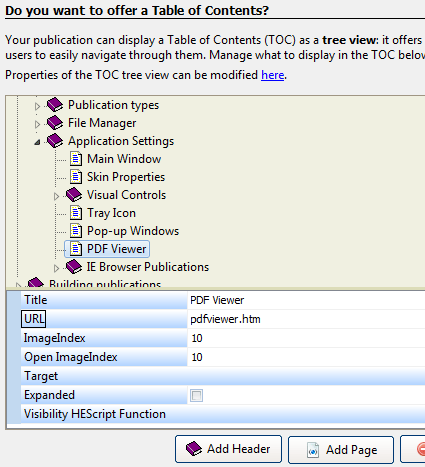 As in HTML Help or PDF files, it is possible to include a Table of Contents (TOC) bar in your HTML Executable ebooks. Adding a table of contents to digital publications provides end users with a hierarchical view of the content. Users click a topic listed in the table of contents and are taken directly to the information they are looking for. 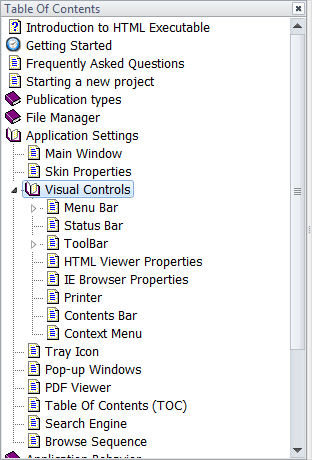 Import your own icon images for the TOC, make it sticky (always visible)... A lot of options are available. The TOC can be context-sensitive: it is automatically synchronized with pages that are displayed. Include a Browse Sequence: HTML pages are displayed in a specific order (there is no need to click hyperlinks to navigate through pages) of your choice. The TOC can be updated at runtime. Ebooks can manage user favorites: this popular feature is similar to the one in web browsers. Users can bookmark the pages they want and automatically jump to them (this feature is available both for PDF or HTML documents).